As many of you know, this was the race that I've been waiting for for over a year. Every training run and every race I've done up till this point was in preparation for this half marathon. So you can imagine my disappointment when I started to get horrendous knee pain 4 weeks before. My mom agreed to run this race with me and we agreed that we would stick together. We're not as fast as Lacey, so my mom and I started in corral "D" and agreed to meet up with her somewhere at the finish line! Even though my IT band was feeling pretty tight during the 10K, I was able to get through with a run/walk/run and was still happy with our time that we finished in. I was hoping that the same would be true for this race, but I was in pain before we even completed the first mile. I stopped at the first medic tent and slapped on some Bio Freeze with the hopes that would help. As a matter of fact, I stopped at every medical tent along the course and reapplied the Bio Freeze. Even though I was in pain, I was able to push through it and I was very happy with our time at the 5K mark. We had a glorious time running through Magic Kingdom and I almost forgot about my pain! I heard a lot of remarks about how bad the bottle neck would be while running through the castle and that we would probably have to walk so I was pleasantly surprised when we got to the castle and had plenty of room to run right through! By the time we left Magic Kingdom we were still making pretty good time at the 10K mark. I thought that we might still actually meet our goal time that I had for us in the back of my mind. I was able to continue to push through till mile 8.5 ( right after the Clif Bar station) and then it was all down hill after there. My pace drastically slowed down and I had to walk all of mile 9. I felt bad because I knew my mom had it in her to keep going but she held back and walked with me. From mile 10 on, I tried to run a little bit more. 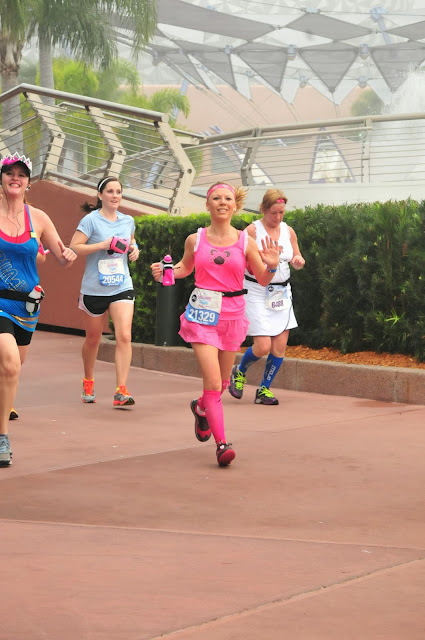 As we did the final loop around Epcot heading to the finish line, I told my mom that we were going to sprint to the finish. I gave it all I had and we finished strong! I think I gave a little too much though because after I received my medal my leg tightened up and I could not move it. I wanted to hobble over to the medic tent but they made me sit in a wheel chair. When I sat in the chair, the medical volunteer was trying to talk to me and I couldn't even speak to her because when I sat down it was like I couldn't breathe. They thought I was nauseous and that I was going to throw up and they gave me a bag. I was not sick, I was not nauseous , and I was not going to puke. I just felt like I had just lost my breath. I felt a bit silly that everyone was over reacting, but it's nice to know that they are all prepared for the worst. When I got inside the tent, I had my blood pressure taken and was given some advil and then a doctor came over to check out my leg. He wrapped it up pretty tight and sent me over to the massage tent. Which was good because I had planned on getting a message anyway. The photographer caught us as I was hobbling out of the medic tent! I was finally able to make my way over to the Glass Slipper Challenge line and receive my medal for completing both races! Will I do this race again? My final thoughts and comments on this 13.1. Lots of people commented how hot and humid the race was. In all honesty the heat and humidity did not bother me one bit. Maybe if I lived in a climate where it is often humid I would mind it more but to me it was just warm and that felt good. As we were running under the underpass by the Contemporary ( Where the guy with the Mickey hands was) I couldn't breath. I almost thought I was going to hyperventilate but then after I ran out from under there I instantly felt better ( I don't know if this had something to do with the humidity or if it was just how the air wasn't circulating). Did anyone else feel like that? I felt the course it's self was an easy one. The inclines did not bother me one bit. However, I did feel the course was very narrow in most spots. Even on the roads that were flat, I felt they were uneven. Because I was running and then slowing down, I tried to stay to the side of the road. But some of them were so uneven that I knew with my knee problem it would be dangerous to continue to run there. I apologize to those people who had to run around me. I was so worried about what I was going to do about water stops. It ended up that I did carry my own hand held bottle and stopped at 2 or 3 water stops to fill it up. I worried about the bathroom stops as well. I am SO proud of myself for not having to stop at all! Running with my mom put me at ease. I know she could have done much better if she was running on her own, but it was nice having her with me. We didn't listen to our I-pods at all. We talked most of the time and had fun stopping for pictures! I am so proud of her! I actually felt good this whole race, I mean I definitely had the endurance to keep going if only my knee had felt better. The 13.1 miles really did fly by quickly. I had a feeling it would! During my training runs, I was finishing 13.1 in 2:20 at a pretty comfortable pace. So considering this was a Disney race and there would be a crowd and I would be stopping for pictures, I had a goal of finishing in 2:30. But then I had to deal with this whole knee pain so I knew 2:30 wasn't going to happen. So now my "B" goal was to finish in less than 3:00. About mile 4 we got passed by the 2:15 pace group. By mile 10 we were still on target, but then shortly after that we got passed by the 2:30 pacers. I thought maybe we could still finish in 2:45. It ended up we finished in 2:40. I will absolutely do this race again and cross my fingers that my knees are in better condition next time because I really believe that I can do much better. I am happy with my time considering my injury and how many stops we made, but I know I have it in me to do a bit better. Have you ever suffered an injury during a race and had to "Push through" it? Please tell me about it? Did you run PHM? What did you think of it? So amazing that you were able to run the race with your mom, what an awesome experience! I have been injured for 2 of my races the last one being the Disney Marathon in January. I have never felt pain like I did that day, but I knew I had to finish and I just kept telling myself you will get to sit down soon just keep going (just keep swimming!!) and you will be able to drink all the water in the world and you will get an awesome medal. I am all about the mental game and telling myself what I will get at the end, this helps me so much when I am having a bad race! If my mental game is 100% I can push the pain out and just concentrate on the finish! WOW, good for you for finishing the marathon ( I couldn't imagine being in pain for that long)! I have so many injuries, I don't know what a race would be like without them flaring up. That's so impressive how on top of it Disney was with your injury though. Glad to see they are looking out for everyone's safety & health! 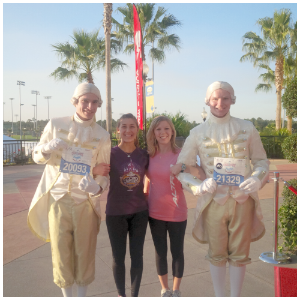 Yea, Disney races are great in all aspects! They really take care of their runners! I'm pretty sure that IT pain was what contributed to it! I love that you ran this race with your mom! Perfect girls' weekend :0) Great job pushing through, though I really really hope that leg pain gets better very soon. 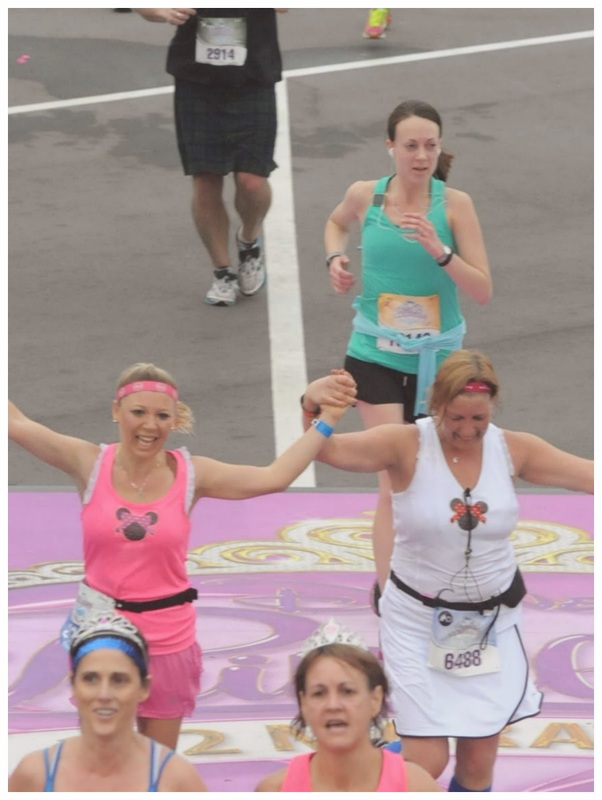 Love all the pics you ladies took, especially that very first one with the high-five in front of the castle! This race is so much fun - I did it last year and can't wait to do it again in the future. I agree that really the only bad thing about it is the narrow parts of the course...makes the massive crowding seem even more crowded! You are right Lauren, It is a perfect girls' weekend. I hope we can all do it again next year and hopefully I will be pain free! 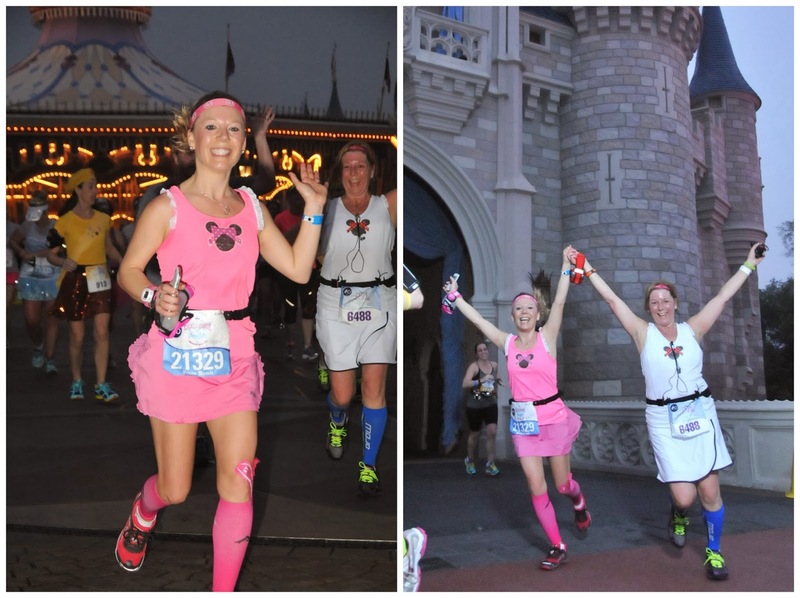 During the Disney World Half I definitely had to push through calf and shin pain, and my shorts chaffed my thigh. Although we had to slow down considerably, I'm so glad that I pushed through and finished. I would have been so disappointed in myself if I hadn't crossed the finish line. Thank you! There was no doubt in my mind that I wouldn't finish. I was prepared to walk and hobble if I had too! Really proud of you for finishing Meranda. Pain during a run is a very tricky thing. In some cases, it is best NOT to continue because you risk further (and more lasting) damage. I am glad to hear that you did check in at all the med tents - even if it was just for biofreeze. I think if you looked really poorly - they may have asked you to pull out. I'm also glad to hear they made a fuss over you at the end. It could have been worse - but I am happy you are okay. Hopefully your injuries will heal quickly and you will come back strong. When you get a chance, look at Chi Running - the techniques are perfect for someone that is rehabbing from a running injury and wants to avoid injuries in the future. Happy to say I've been injury-free since I first discovered it in Oct 2012. I was worried about this same thing. I knew I had to finish the race and was wondering if I was causing further damage! I went back to the room and iced for a bit and then spent the day at Magic Kingdom. The lady at Tony's Town Square even let me rest my leg and brought me a bag of ice! Disney is great in all aspects! Huge congratulations for getting through the race. It is always nice to have a buddy with you and having your Mom had to give you a huge lift. I have been lucky so far, and never run a race injured. I loved the half marathon and as you know it was a personal worst time for me. 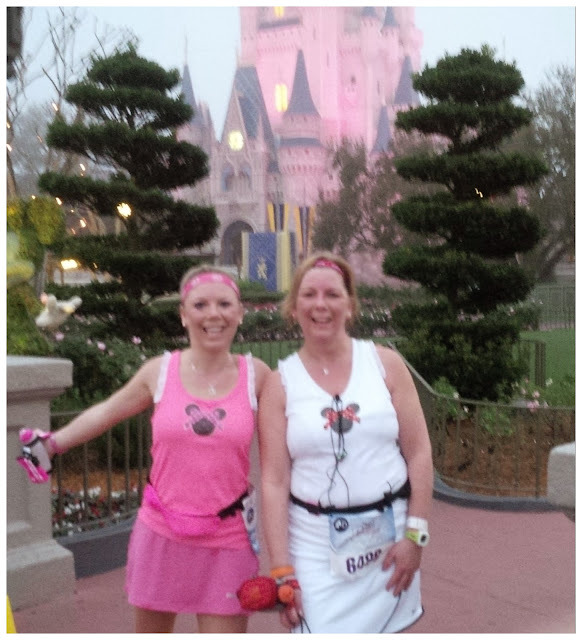 But using a Disney race as a training run can be really fun too! I plan to go back next year and hope we see you, your sister and your Mom. We plan to go as trio, Christine, my sister Alison and myself.....at least that is my plan anyways! We plan to go as a trio too! I really enjoyed having my mom there and hope I am even speedier next year so we can run the race at her pace! So proud of you for finishing! I'm also so glad that you had your mom there as support, because I feel like your (or anyone in your situation's) mentality probably could have taken a major hit if you were struggling alone. I hope your knees feel better soon and that you can run the race SUPER STRONG in the future! Congratulations!!!!! Thank you so much Rachel! It was definitely helpful to have someone there with me especially for those "just in case" moments. Which I almost had after crossing the finish line! I was thinking about you on the course and was wondering if I would see you. After I had my leg wrapped at the medic tent it made it much more manageable for me to walk. I was icing like crazy too. I am definitely planning to go back and do it next year. I better see you there! Way to push through it. I always think of the vultures from Bedknobs and Broomsticks when it comes to finish line medics. They get the stretcher and dive in to help the runners. Yup, they sure are prepared! Wow way to push through... I finished a 10k in July once and while I took it easy and was comfortable, while waiting in a portopottie line at the end all of the sudden WHAM I felt aweful and found myself in medical tent. Glad I went better safe than sorry and glad you went too. Nice job! Thanks Julie! That must have been a scary situation for you. Yay, that's so wonderful that you were able to do this with your mom and finish together! And the photos look great. You can't tell from your face that you were experiencing any pain at all :) I hope that the knee heals fast. Thank you! I must be able to hide pain well! Nice work! I'm sorry that you had difficulty. I know how hard that can be, but you finished! Yes, the finish line is a glorious place! Thanks Amy. I started PT today so I am hopeful! They use to allow strollers in the family 5K. That would be perfect for you to do with your family! I had the exact same problem during the WDW Marathon. I spent the second half in agonizing pain and if I walked at all, it hurt really badly to start moving again. I don't know if it was that slope at the tunnel that did it, or the general slope of the roads but I was hurting bad. I feel so bad for you, a marathon is definitely a long time to be in pain. I did RUN across the finish line this time, but I was in pain! It sounds like you had a mostly awesome race, and finished well! I hope your knee is feeling better now, or at least starting to! Thanks Lauren! overall it was a great race! I'll be hitting you up for advice!! So inspirational, Meranda! Hoping you recover quickly from your knee injury. Even with all the pain you were in, you found the joy in your run and overcame the physical pain. Thanks for sharing your experience at the race. I'll be at the GSC next year because I had to defer this year. I had to push through to finish my first marathon. At mile 17-18 I had the worst blisters and major back pain. I pushed through to finish too, there was no way I was going to go through all that training and not get my medal! It took almost 2 months to recover but I would still do it again if given the choice. So glad that you were able to finish your race too! I hope to see you next year at GSC! Congratulations!! You did so awesome!! 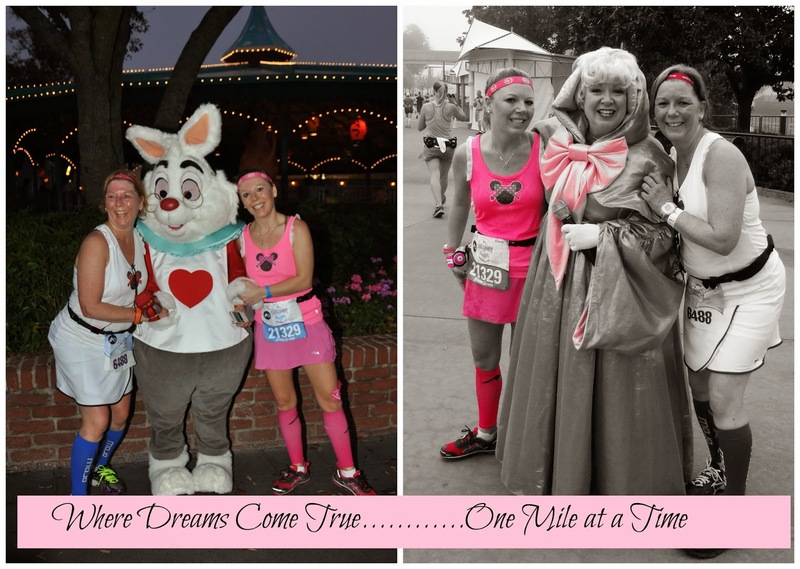 The 2013 PHM was my first RunDisney race and my first half marathon ever. 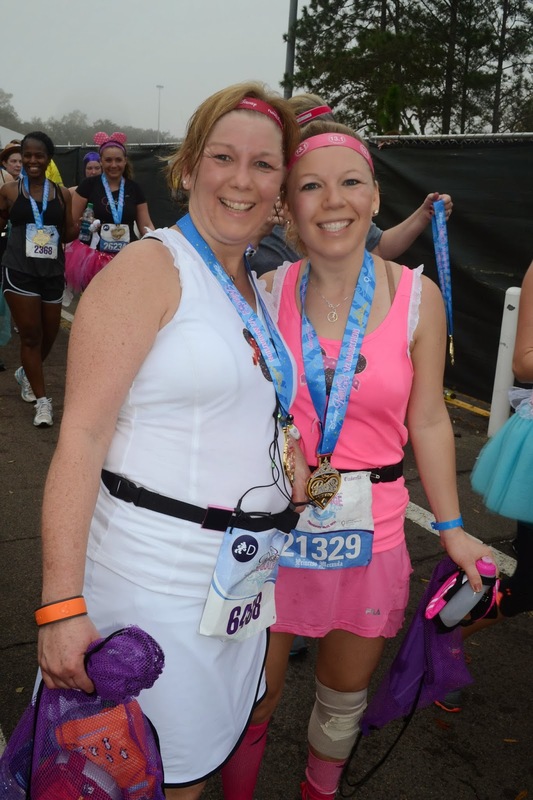 I also ran it with my mom and made some of the best memories of my life! I also had the same finishing time as you, I thought the race was crowded but I was expecting that. The PHM will always hold a special place in my heart and I can't wait to run it again. You are right, it is crowded in some spots but that is to be expected like you said. 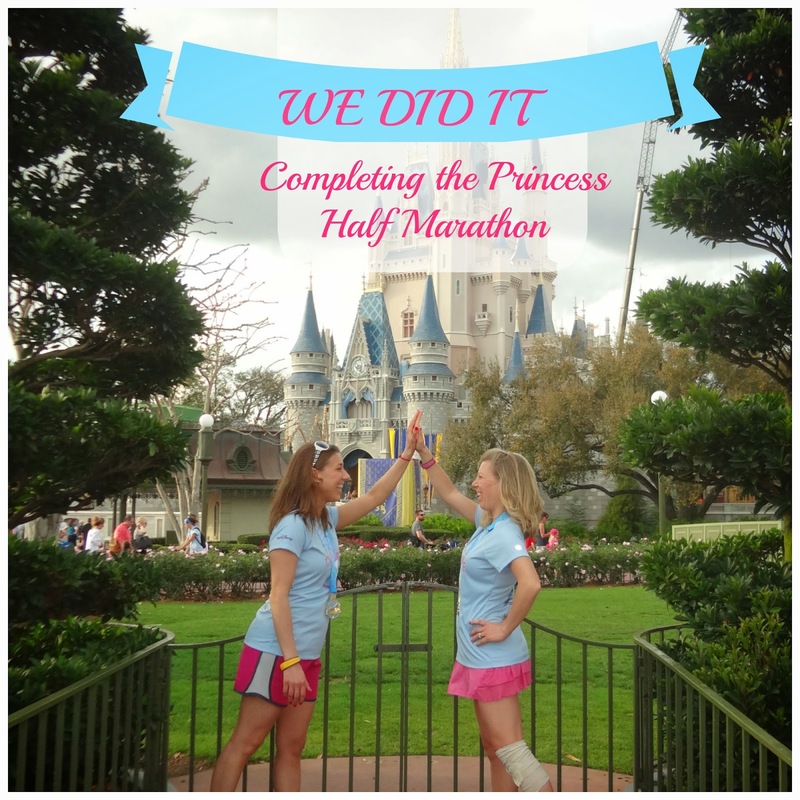 It is definitely a race to do just for fun and the camaraderie of the other princesses! Thank you Cassaundra. Those are actually compression sleeves from Pro Compression and I love them! I liked our outfits too. I can't wait to work up a design for next year already! Sometime during mile 11 of my last half, my right calf cramped up solid - like a rock. I pushed through, got a PR and later discovered that I had a stress fracture in my shin. Ouch. I'm sorry your leg gave you so much trouble, but way to finish strong! Great recap! I thought it was soooo humid, and it definitely slowed me down a bit! I agree with you that I was so happy to be able to run through the castle because I heard that it would be too crowded! I thought it was a really fun race and I'm so glad that it was my first half! What an inspirational post! I'm so glad you completed the race. Congratulations! I felt like I could have almost written this. That's so cool your mom stayed with you. My friend hung out with me for awhile but I think she eventually got bored and pushed on ahead. Like you, around mile 8-9 that's when things started really hurting with my calf/shin. It was tight before, but now I felt actual pain. And of course I think you know that I'm still in pain and can't run. :( Although thankfully I've been able to substitute a few exercises. I don't think I'm cut out for long races and will stick to the shorter ones and just enjoy my beach runs once I'm healed. So proud of you for finishing and getting through it!! Congratulations! Thanks Tonya! Enjoy your beach runs! I'm so sorry about your knee pain. That happened to me during the NYCM and it was so disappointing. But Congrats on finishing anyway and getting to run with your mom! Sounds like an awesome time! Being injured during a race is always a bummer! Good thing we always have next year! Congrats on finishing! I'm sorry about your ITB, I know that feeling all too well, I really think you should try ART! I hope you'll be able to rest a bit, and this pain will be a thing of the past. Congrats to your mom and Lacey too! Thank you so much Kristy and for all your great advice earlier on! 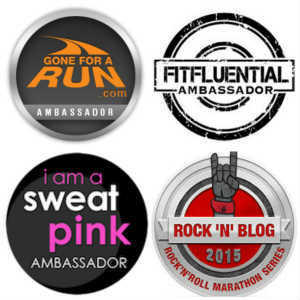 Yes, you should come run with us next year! Despite the injury, I really did have a great time! Congratulations and great recap! I'm so sorry about your knee pain but way to go on pushing past it and finishing! I hope you get it healed up soon! I think we probably passed each other on the course at some point April! First off you and your mom are so adorable!!!!!! And you did so amazing.You were lucky you did not get caught in the castle bottleneck. I did, and have no pictures of coming through the castle-I love your picture of you and your mom. I can't wait till next year!!!! Thank you so much for your kind remarks! We hope to run next year as well! Shamrock Marathon: Do Pacers Really Help You?